The Easter Basket quilt block looks simple on the surface but don't be fooled that simple equals an uninteresting quilt. By changing up the "flower" colours in the block, and perhaps also changing the "basket" fabrics, you can make an interesting assortment of final blocks for your Easter quilt. In the sample quilt layouts shown, notice in the straight set quilt, four blocks have been used, with each block being rotated by 90 degrees, to create a larger block. The result is that a secondary pattern emerges. Can you see the "stars" made by the flower fabrics? 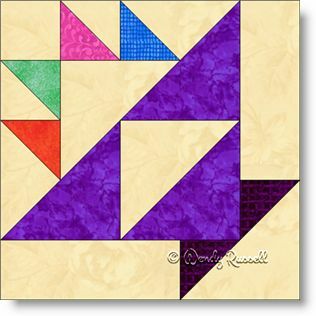 The construction of this quilt block looks complicated, but it is really just a matter of putting the pieces together in the correct sequence. Who doesn't love a puzzle, and a simple puzzle at that!